I wish I could say that I was a convention virgin but that statement is something of a fallacy. 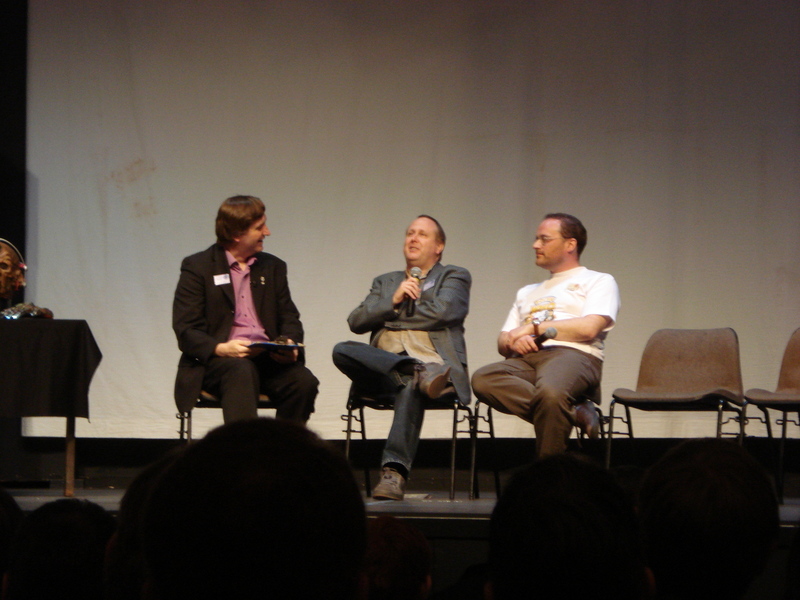 Back in the late nineties, I was persuaded by a friend of mine, on a couple of occasions, to attend conventions for the rock band, Rush, up at Leicester University. 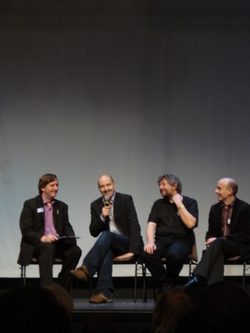 Primarily, these events were to celebrate the Canadian band and their extensive back catalogue of music. As it was located in the bar of the main building, the events were well-lubricated by copious amounts of alcohol. Generally, it involved video shows of band members and those associated with them giving interviews on a large screen set up in the bar, auctions of CD's and other band paraphernalia, 'karaoke' sessions involving a live backing band and members of the clientele going up on stage and providing vocals for various Rush classic songs and such. A very entertaining time was had by all, from what I can remember of the actual events themselves. 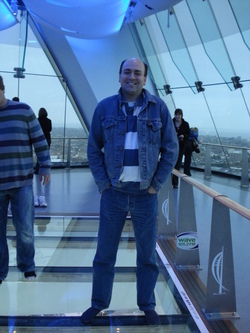 October weather can be a mixed bag of seasons in one day so, clad in t-shirt and my denim jacket which was a veteran of many Status Quo concerts, my girlfriend and myself motored the short distance from her home in Southampton to the neighbouring city of Portsmouth, a 20 minute drive along the M27. Situated in the heart of Portsmouth city centre, the New Theatre Royal serves as a very useful venue for touring theatre productions as well as locally grown talent. After waiting outside the theatre wondering where everyone else was, I gave Keith a call to see where they were and had they found the way to the theatre. It was only when Keith said on the telephone:"Look behind you...", that we realised that they had been cosily ensconced in a pub about 50 yards up the road and were all sitting down, enjoying a well deserved cup of coffee. After we had had a sit-down and chit-chat, it was a casual walk back to the Theatre Royal and our first job of the day. As there were people milling around outside having a quick ciggie, we made use of our fair nations draconian anti-smoking laws and started distributing copies of our specially prepared Dalek Masterplan podcast CD, recorded a week or so before and made in order to spread the word of Staggering Stories and to introduce a lot of people to our hilarious and sometimes bizarre slant on Doctor Who and science fiction in general. We were all given a handful of CDs to distribute to the people gathered outside. Tony, as was his wont and efflusive self, waded into the throng cheerfully waving the discs and returned momentarily, empty-handed and with a gleeful expression on his face. I , on the other hand, went up to one individual and flourished the discs under his nose and casually enquired whether he and his friends would like one. One surly grunt later and a curt "No thanks", I circulated, only to find that my peers had been doing their job too well. Feeling slightly deflated, I returned and offered my remaining discs back to Adam, in the hope that they could be given to fresh and eager faces later on. 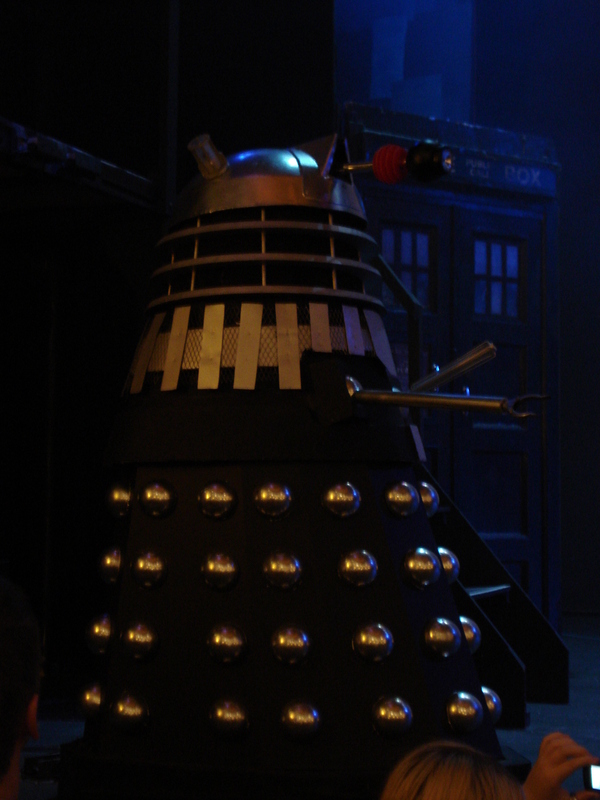 Much to our surprise we found out that The Dalek Masterplan had been running for most of the week to sell-out audiences considering that this play was not produced on a lavish budget . It was very heartening to also hear that all profits from the show would be divided between local charities, the BBC Children In Need Appeal and the restoration of the New Theatre Royal. 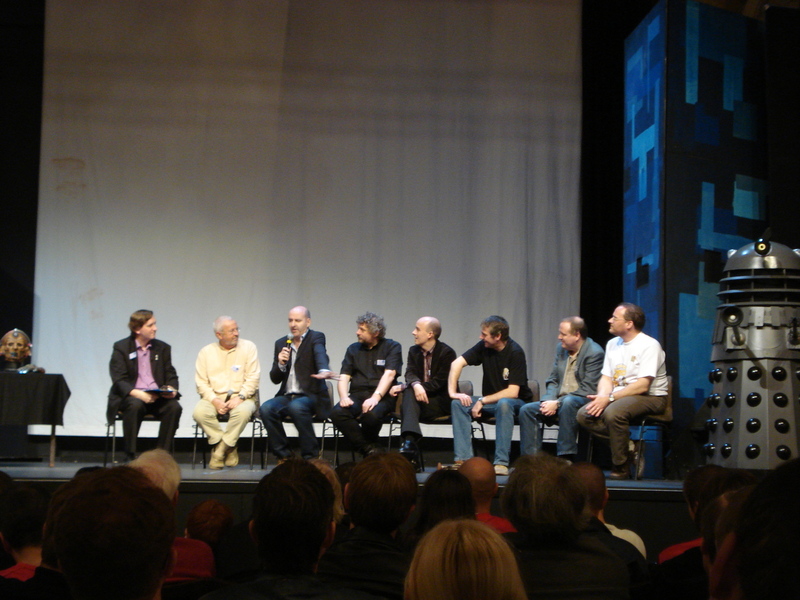 The assorted mutterings from the audience that are everpresent in any theatre died down as the convention began. Short clips of film depicting what the relevant guest to the Doctor Who mythos was shown as a prelude to their appearing on stage. First up was one of the primary players in tonights proceedings. 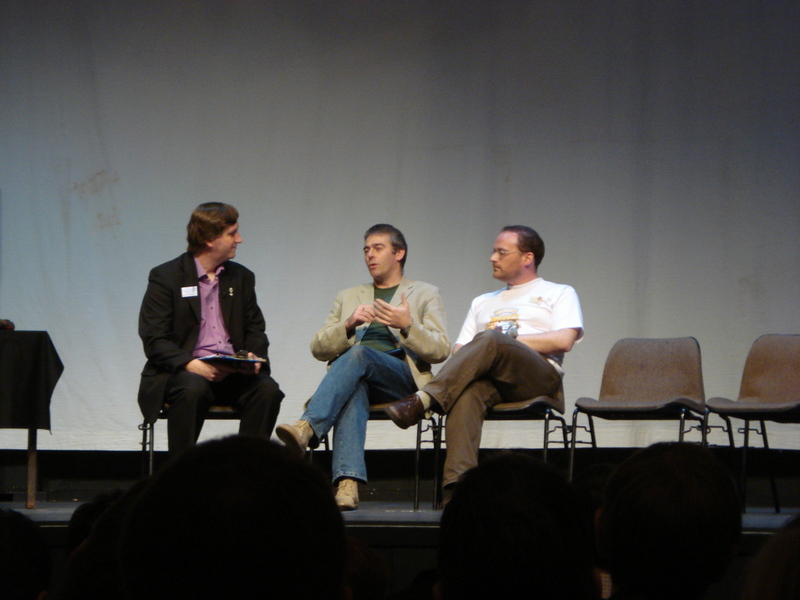 Nick Scovell and his Interalia theatre group have done a couple of other stage adaptations of Doctor Who screen plays in the past. Sadly this was to be the last of them but he promised that tonights show would be a fitting culmination to all he had achieved. Swiftly following on his heels was the stage manger and director for the night. He gave a description of what the play was about and the original Doctor Who story that it was based on but he was not giving away to much as he did not want to blunt our appetites for the evenings proceedings. As is the wont of all stage directors, he had to hurry away as he was needed to get things proceeding underway for the play later on. Peter Labrow was up on stage next. To the uninitiated, he is the compiler of the DalekLinks website. 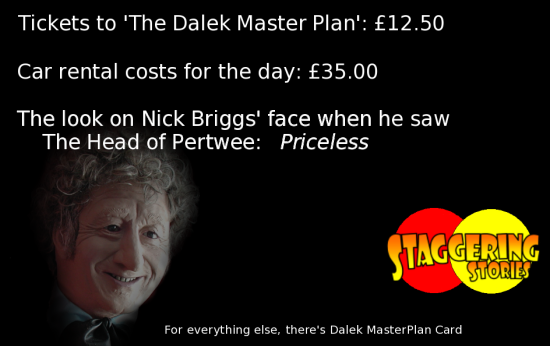 If ever you wanted a truly comprehensive compendium of all things Dalek, he is the man to see. 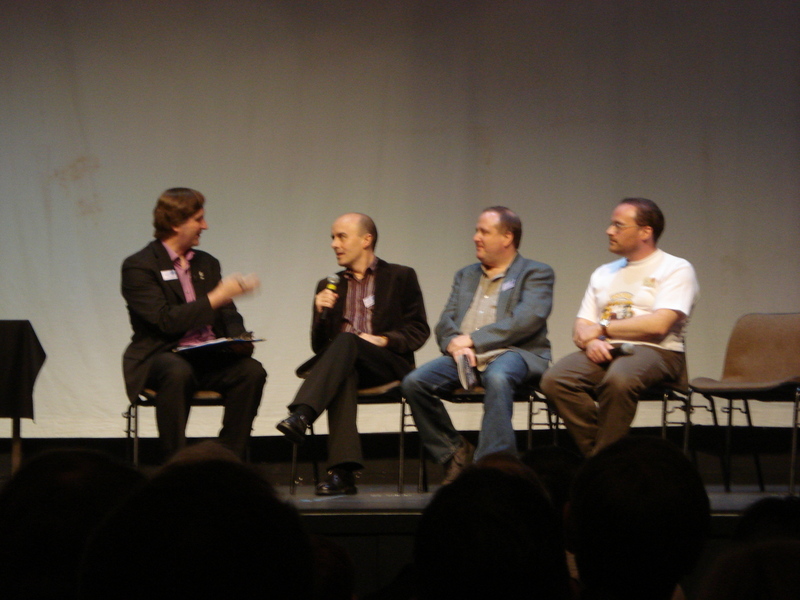 When the all-new series came on air, hits to the site absolutely went stratospheric as people who had previously never watched Doctor Who, wanted to find out about the series which was making such a hit all over again. Even though the series is well established as a mainstay of Saturday night entertainment, he explained that he was still getting approximately 5000 hits a day, no mean feat by anyones standards. We have had the honour of our website being dubbed "beautifully insane" by DalekLinks which is something of a tip of the hat to us. 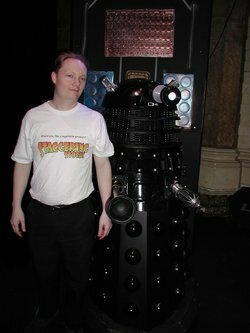 All you have to do is go to the DalekLinks website, click on the fun stuff link and we should be there at the foot of the page. 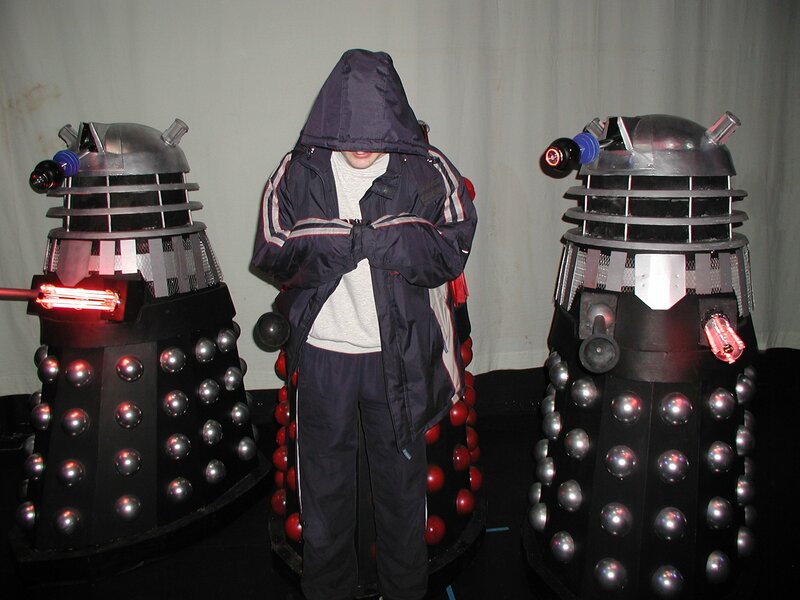 Staggering Stories has been given a two Daleks out of five rating. 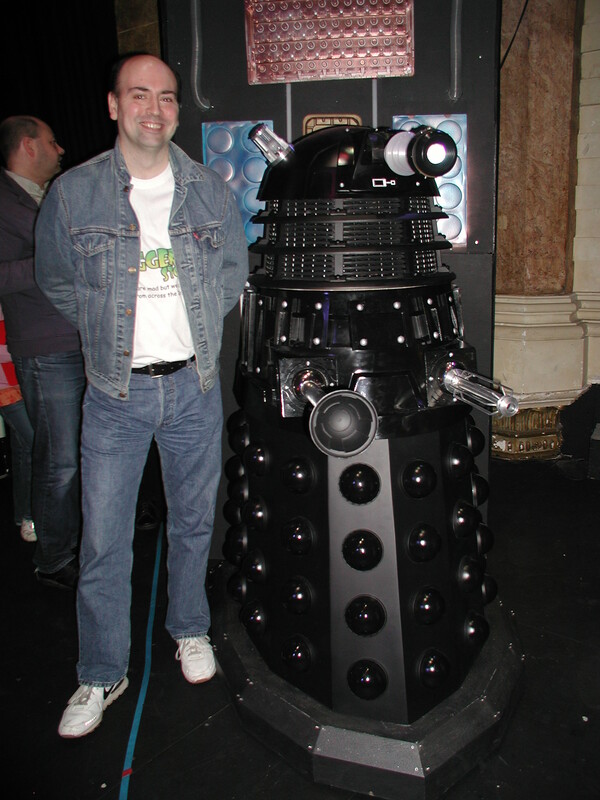 I originally thought this was a bit of a low rating but when you realise that the site is primarily devoted to all things Dalek and that the Mr. Dalek stories that are featured are only a small part of what the entire site is all about. 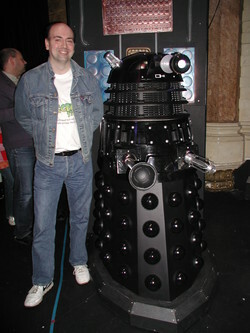 A lot of links on the site only have one or no Daleks so to be awarded two Daleks was praise indeed. A certain amount of athletic prowess and being able to operate in a very confined space are two of the paramount requirements for operation a Dalek and Barnaby Edwards did all this with a consummate ease that spoke of many hours being stuck inside a Dalek casing. He looked like he was a veteran of many conventions so he looked perfectly at ease as he related more of the light-hearted moments posing as the Doctors nemesis. The next guest was a perfect illustration of how the Daleks can appear in all their nastiness on the pages of a book or in a short story. 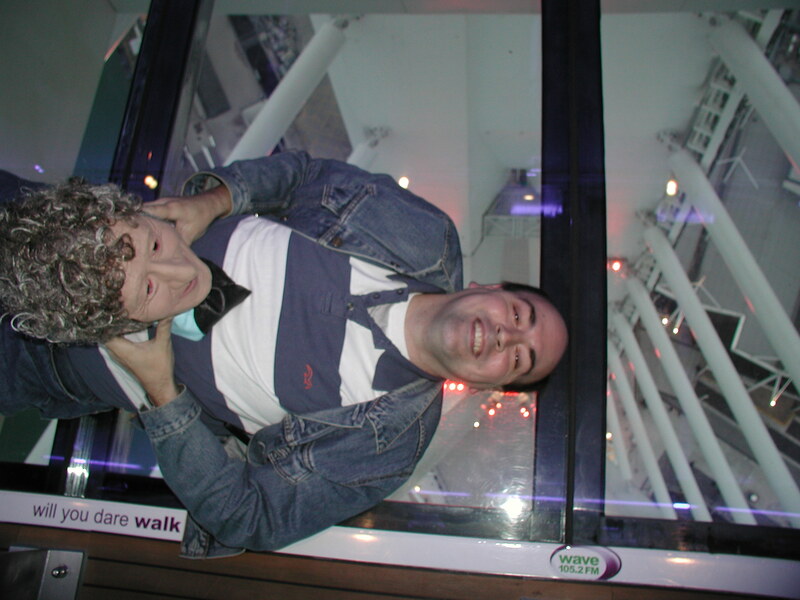 Rob Shearman is a very well-known author in Doctor Who circles. He has written many Big Finish productions but the crowning glory of his so far is the Christopher Ecclestone Doctor Who adventure;"Dalek". There are those in the Doctor Who camp that see this episode as shedding light on a more sympathetic side of the Daleks and there are those amongst us who are babbling with rage who see this episode as an abberation. Our very own Karen Dunn, known to our podcast listeners as 'Fake Keith', has vented her spleen copiously and had a proper foaming at the mouth rant about this on an earlier podcast. As with all good debates, there has to be two opposing sides in order to give voice to any well-constructed and relevant arguments and points of view. As with all tales of evil and its downfall, there has to be a creator to all of this nastiness. 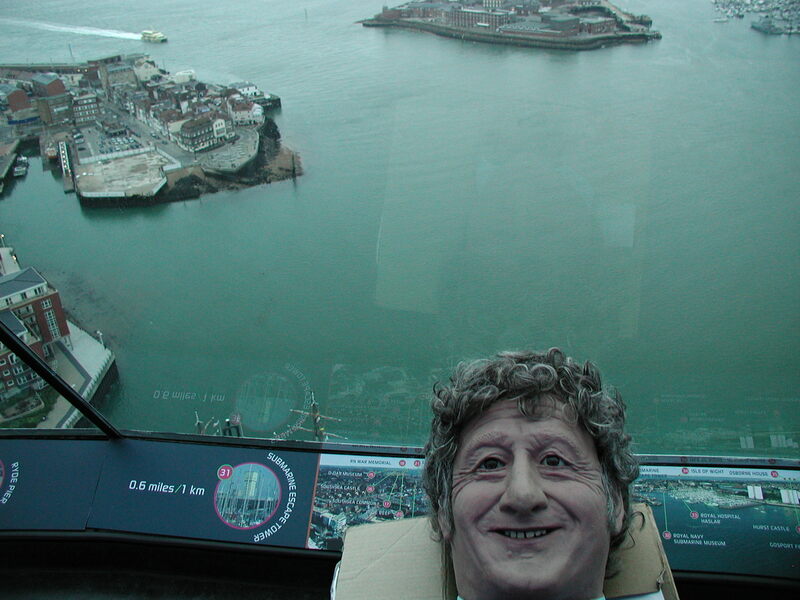 Davros, the 'wheelchair'-bound genius and profound nutcase was the creator of the galaxy's most dire threat. Ruthless, manipulative, cunning and without any scruples whatsoever;all those qualities that our world dictator waiting in the wings and website coordinator; Adam can only aspire to. Ever since the moment that Tom Baker staggered out of a room with a piece of malovalent seaweed wrapped around his neck, Davros has imprinted his self on the Doctor Who fans psyche. Terry Molloy ambled out onto the stage to be met with cheers and rapturous applause from the audience. wearing a beige top, matching trousers and a pair of those hideous 'Croc' shoes, he proceeded to regale the audience with his tales as everyones favourite megalomaniac. All throughout the history of Doctor Who, there has been considerable argument as to what a Dalek is. This was firmly resolved by Terry explaining that the casing is a MK II travel machine and the nasty bubbling green lump of hate that goes inside is a Kaled mutant. The resulting combination is called a Dalek. It only seemed like a little time had passed but all too soon, the convention had finished and it was time for the auction. Amongst those items being auctions were props from the stage production including a couple of very convincing laser rifles and various items of Doctor Who merchandise, was a signed poster of the stage play. It doe not take much working out to say that the poster was the main thing that everyone was bidding for. 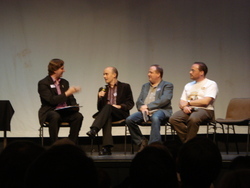 At the end of the auction, the floor was thrown open to questions and in the majority of cases, they were polite, succinct and to the point but in one case, someone up in the balcony came out with such a long rambling question directed at Terry Molloy, that he had to strain to hear it and to answer as best as he could, having lost the original thread of the question long before. All to soon, the convention and auction had ended and more than a few people had expressed an interest in the Doctor Who memorabilia that was on sale downstairs. casting a casual eye around, it was a veritable Aladdin's cave for the Doctor Who fan, all exorbitantly priced but eagerly snapped up by those ready to part with their hard-earned pennies. Our collective stomachs were grumbling and we managed to polish off a respectable part of the menu between us all. It was at that time of getting our main course that we smelt a decidedly smoky tinge to the air and when two Gunwharf Quays security staff and a member of Hampshire fire brigade entered the restaurant armed with a large fire extinguisher which he was waving about in a rather heroic manner, we all came to the conclusion that a pan in the kitchens had caught alight and was belching out copious quantities of smoke. As was its wont, the smoke was filling up the place and was even reaching our lofty vantage point on the first floor, overlooking the main dining area. Despite a few light-hearted grumbles from various members of our party about getting a discount for eating our dinner in a slight haze, things went rather wellThe smouldering saucepan was eventually put out and the security guards left, maybe disappointed in the fact that they couldn't wield the extinguisher in a more heroic manner. For those of you who have visited the fair and very historical city of Portsmouth, one thing you will notice sticking up into the sky is the rather imposing Spinnaker Tower. This was originally planned to be opened for the new millennium but to various technical hiccups and construction difficulties, did not actually open until about a year or so later. 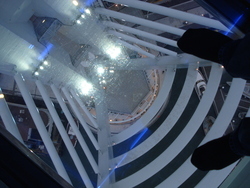 It consists of a slender spire which has the superstructure, holding the observation floors, fashioned in the style of a billowing spinnaker sail. The interior lift which is British-made worked perfectly and whisked us up to the observation floor. However, the external lift, which I believe is Italian-made, still does not work, a few years after its installation. Tony and Karen did mention that they were saving their money for the evening but Jane and myself cajoled and browbeat them in to joining us in our ascent of the Spinnaker. Whilst we were queuing up to pay, a member of the Spinnaker Tower staff, being very consciencious in his duties, asked Adam what was in the cardboard box he was carrying under his arm. Adam duly complied and showed the worthy gentleman THOP* nestling within. After a few moments that seemed to stretch into eternity, the young man forced a smile and emitted a strangled "Thank you" before scurrying off to forget what he had just seen. I must confess that this is the first, and probably, the last time I will see Adams cheeks redden, ever so slightly, in embarrassment. 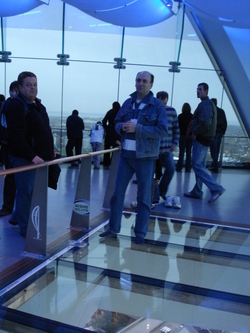 Jane and myself have been up the tower a few times so we knew what to expect but Keith, Karen, Tony, Adam and Jamie were taken aback by the sweeping vista overlooking Portsmouth and looking out to The Solent and The Isle Of Wight. For the brave-hearted amongst you, there is the added attraction of a glass floor section which gives you an unobscured view of the ground approximately four hundred feet below your feet. 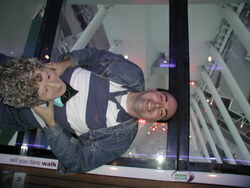 I started merrily jumping up and down on the glass in a cheerfully demented manner. Despite Kiths dire warnings about a Darwin Award nominee who jumped up and down on such a floor. The glass did not break but the seals holding it in place did, so he met a messy demise below... .
Karen, being made of stronger stuff than the rest of our party, had kicked off her shoes and had taken a few shuffling, tottering steps out onto the glass before retreating onto the terra firma of the concrete floor. 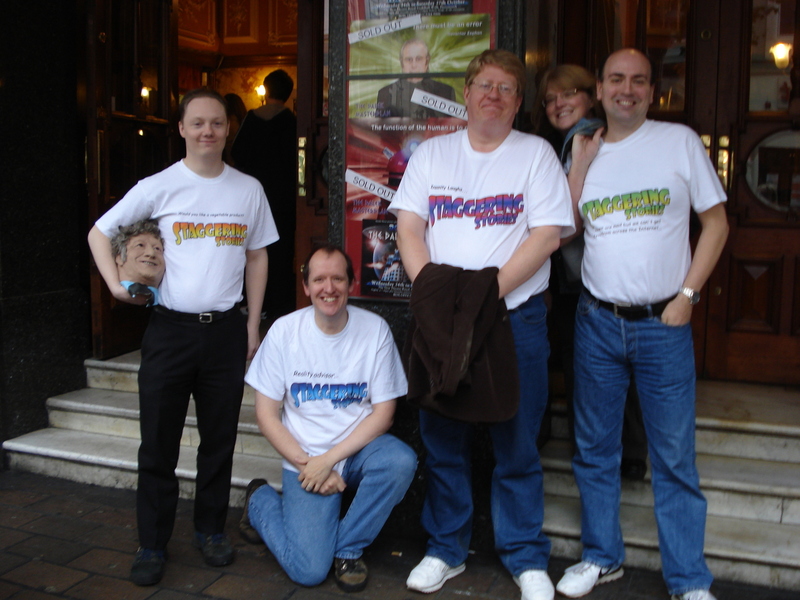 However, all too soon, time dictated that we leave to make our return to the Theatre Royal in order to see the main event. As I said, the play had been heavily condensed , had scenes removed or some new ones added and characters backgrounds altered. One that sprung to mid was that of Katerina. In the original series, she was a handmaiden in the city of Troy when the Doctor turned up and she then accompanied him. For the purposes of the play, she was a member of the settlement on Kemble. A bad move for her as in the original series, she met an untimely end on the SPAR ship when she sacrifices herself to save the Doctor and the rest of the crew. 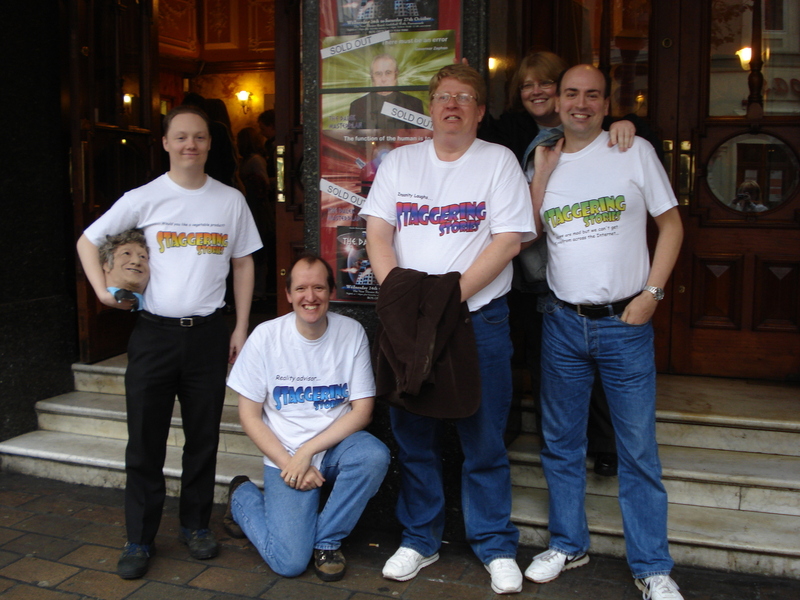 The play begins with the staff of a research facility on the planet Kemble seeing in the year 4000. During the course of the play, which was heavily condensed down from the original TV series, the Doctor discovers a plan by the Daleks to use a previously unheard of device to eradicate Humanity from the history of the universe. Learning of the Daleks' scheme, which hinges on the use of a weapon called the Time Destructor, they determine to warn the authorities on Earth. This proves problematic as the human leader Mavic Chen, Guardian of the Solar System, is a traitor in league with the Daleks. That, in brief, is a summary of what the play is all about. Nick Scovell, a stalwart of Interalia, played a scruffy and unkempt, but very competent Doctor. He took on the best mannerisms of the Doctor, with his tie permanently at half-mast around his neck and his hands gripping at his jacket lapels. With his usual cunning and knowledge of the Daleks, he managed to continually run rings around them. The stage and scenery was spartan but the stage was dominated by two tall pillars, three-sided and covered with various coloured panels, which could be moved by stage-hands seated inside them and shuffling back and forth in order to move them. 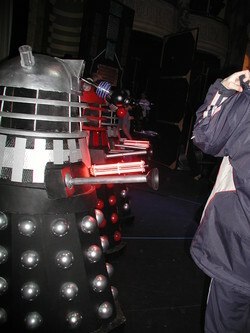 During the course of the play, they served many purposes, including an airlock, to obscure the Daleks on stage when a scene dictated they were not needed and ultimately, one side was covered with dials, sliding scales and gauges, in order to simulate the working surfaces of the Time Destructor. Apart from that, scenery was limited to two stairways leading offstage to show various members of the cast entering and departing various scenes in the play. 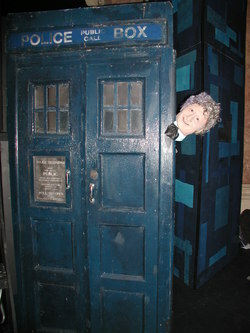 The TARDIS itself was simply a panel fixed to one of the side panels of the stage. Whenever a TARDIS materialisation or dematerialisation scene was played out, the stage was darkened and the various lights were shone in a hypnotic manner while stagehands folded it out to show the TARDIS had safely landed on another planet. The effect was added to by the all too familiar sight of the Doctor opening the false door in the panel and casually stepping through it. The actors threw themselves wholeheartedly into their roles and I must say the they all did themselves proud. The actor who played Mavic Chen carried himself off with considerable, but misguided loyalty and gravitas. Katerina and her brother were carried off with consummate ease and Laura Ford, who played Sara Kingdom performed her role with steely determination. Throughout the play, there were many tips of the hat to the original TV series. 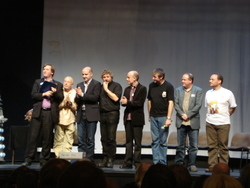 Due to the length of the series of episode, the scenes with the Egyptians, the Monk and the whole Christmas segment had to be removed from the stage play. The audience had be be satisfied with the cryptic comment from the Doctor that he had had no time to wish everyone a Merry Christmas. There were simulated news broadcasts on a couple of occasions during the time where the Daleks and the Human space fleets were preparing to do battle. 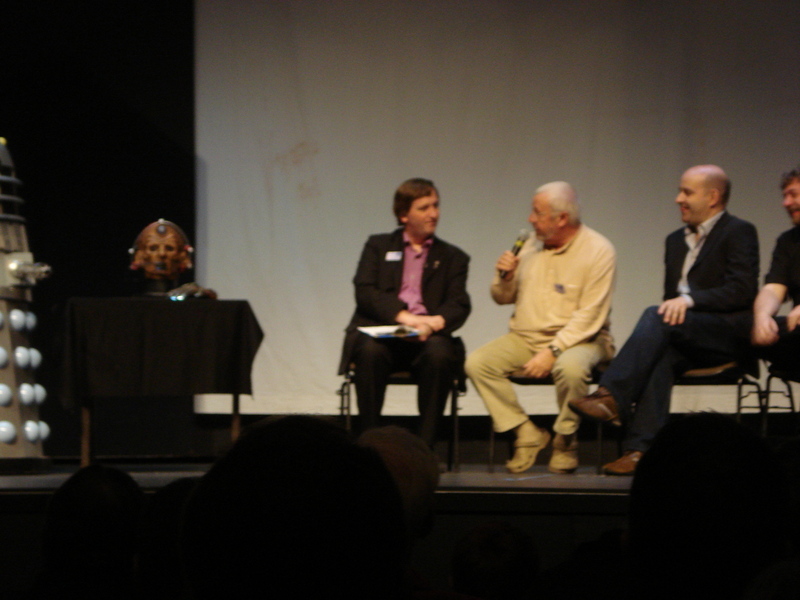 A newscaster, seated in front of a screen showing one of the Dalek mother ships, mentioned an Admiral Skelton, one of the commanders of the Earth fleet, a fond reference to Roy Skelton, one of the primary Dalek voices and operators in the classic series. 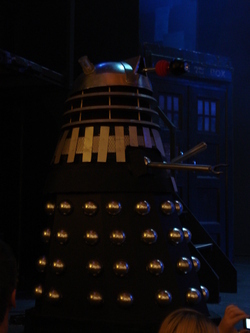 Whenever the Daleks were not needed in a scene, they retired to the back of the stage where they switched off the lights in their eyestalks and the two tall pieces of scenery would draw together to partially conceal them. 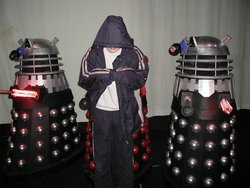 Another thing noteworthy of them, when Mavic Chen met his inevitable demise at the 'hands' of the Daleks, the fire extinguishers were turned on, a la Dalek movies, and he was extinguished to death. 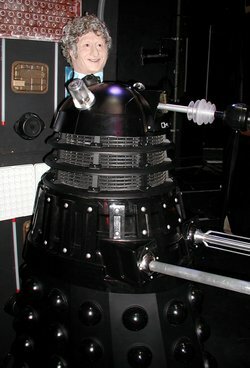 Even though the Daleks used were models used in the 'More Than 30 Years In The TARDIS' tribute show, they were very well built. In the scene where the Supreme Dalek turns up to personally supervise the Time Destructor's operation and the Dalek fleet operations, it is a perfect replica of Dalek Sec from the Cult of Skaro. When the play had finished and after a lot of queuing, Adam and myself and THOP* managed to get up close and personal and have our pictures taken with him. The culmination of the show came when the Doctor hoodwinks the Daleks and inserts the taranium core containing Dalek DNA into the Time Destructor and the device systematically eradicates all Daleks by destroying their DNA . However, the energies released are too much for the Doctor and he has to stumble back into the TARDIS to make a forced regeneration. 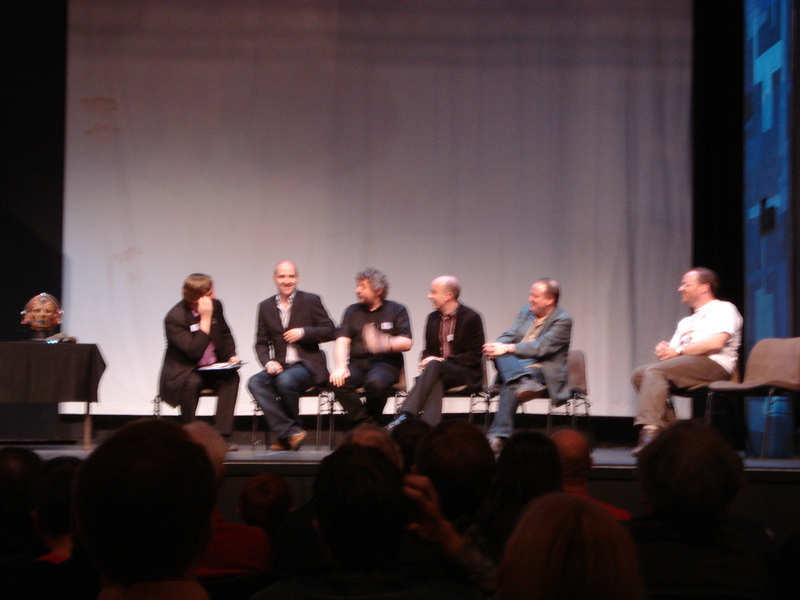 The use of stage lighting was used very effectively to show the energies of the regeneration. A few moments later in a scene that Nick Briggs' must have been longing for, he stumbled out to check his surroundings. 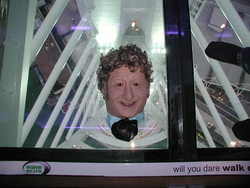 Checking his reflection in the reflective dome of a powerless Dalek. he was shocked to find out that his hair was less than luxurious, he consoled himself by telling himself: "Oh well, at least I'm not ginger..."
The lights came up and applause followed. 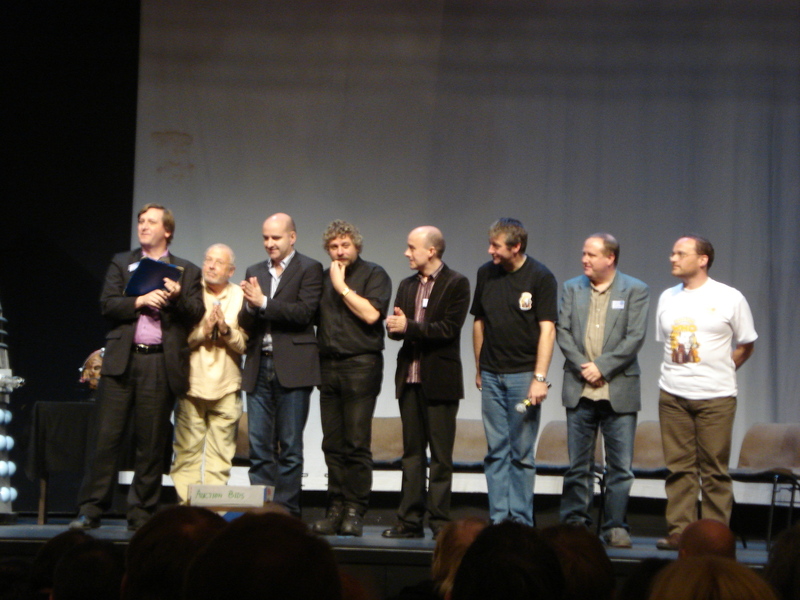 The play had been a very popular translation of the TV series and served as a useful introduction to the younger members of the audience to the very early episodes of the classic series. 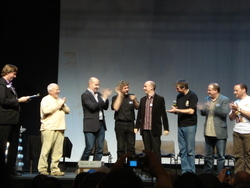 As was expected, the ensemble took their bows and surprisingly, but not totally unexpected, the six Daleks featured in the play trundled to the front of the stage to bask in the applause. Not being physically able to bow, they waggled their guns and plungers in gratitude and flashed their dome lights by way of tribute to the audience before rolling backstage so the operators could get out of their undoubtedly cramped and hot conditions. As people rose from their seats, a member of the cast came to the front of the stage and declared that the audience could come up onto the stage to have a chat with various cast members and to inspect the Daleks at close quarters, as this was around the time the the annual BBC television 'Children In Need' telethon was looming large in everyones thoughts, a donation of £2 was required to gain access to the stage. Thinking this was a small price to pay in order to gain access to the stage to shake plungers with the Daleks, we sauntered out onto the stage. Naturally, THOP* made an appearance and the actor who played Mavic Chen, after he had finished laughing, and other assorted members of the cast and audience, congratulated Adam for having the temerity to carry such an unusual object around with him for the best part of the day. I think the crowning moment of the entire evening was when Karen, Adam, Jamie and myself returned to the bar area for a swift half before departing. There were still quite a few people dotted around, including a few members of the cast, who were deep in conversation with members of the public. 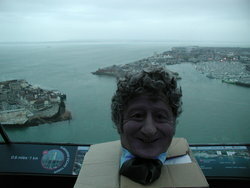 Tony, who knows quite a few people in the whole hierarchy of Doctor Who, had managed to capture the eye of Nick Briggs. After a few moments of conversation about how good the play had been and the extensive back catalogue of work that he has been involved in, he expressed an interest in what was in the cardboard box that was on our table in the bar area. Being the one closest at hand, I picked up the cardboard box containing THOP* and before everyones eyes, I reached into the box and pulled out THOP*. The look on his face was indescribable. Horror, fear, revulsion and morbid fascination tumbled across his face in rapid succession as he took an involuntary step backwards. If I were struck by lightning tomorrow, I could die content in the knowledge that THOP* had had the desired effect on a member of the Doctor Who pantheon. Once he had recovered from the shock of seeing a disembodied latex head of a former Time Lord, he made light of it and quipped that, in future stage productions of Doctor Who episodes, he should emerged from the TARDIS clutching a bloodied knife and the THOP* in the other, with a suitably deranged look on his face and say with a demented tone in his voice: "I'm sorry folks, tonights show has been cancelled..."
Our job done, it was time to make our way out into the cold and wet streets of Portsmouth to make our way home. After bidding farewell to Keith, Karen, Tony, Adam and Jamie, Jane and myself made our way back to my car which was parked just around the corner from the New Theatre Royal. Running the gauntlet of the hoardes of smartly dressed and sometimes drunkenly belligerent clubbers that were crowding the streets, we made it back to my car which was surprisingly in one piece, unvandalised and still in possession of all four wheels, unscratched paintwork and no signs of any drunken couple indulging in a drunken moment of alcohol-fuelled passion on the bonnet.